Taigh Dhonnchaidh is a traditional croft house cottage in the village of Peninerine. The property has recently been renovated to provide modern, spacious living amenities while you discover the surrounding stunning scenery of the island. The property sleeps 6 and comprises of 1 king ssized room, 1 double room, 1 twin room, 2 en suites (shower & bath) and a family family bathroom. The cottage is situated in the village of Peninerine on a working croft. 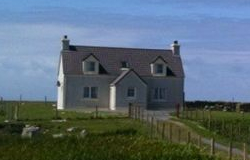 It has clear panoramic views of the 3 Bens which overlook the the island of South Uist. The island is also home to some of the finest trout and salmon fishing lochs in Scotland. The interior of the cottage provides spacious room with modern facilities where you can relax after a day exploring the Isle of South Uist. The adjoining dining kitchen is fully modernised with cooker, fridge and microwave facilities. Seperate utility facilities are also provided. Washing machine, tumble drier and outside washing line. Taigh Dhonnchaidh is the perfect place to enjoy the unhurried pace of island life during your visit to the Outer Hebrides.